With thousands of acres of unadulterated habitat, real wildlife experiences come easy in and around the village of Estes Park! Nearby environments are home to more than 63 species of animals, including bear, deer, elusive mountain lion and bobcat, and bighorn sheep. Whether you&apos;re walking around quieter sections of Estes Park, taking a scenic drive, or traveling Trail Ridge Road in Rocky Mountain National Park, chances are good that you&apos;ll see some wildlife. 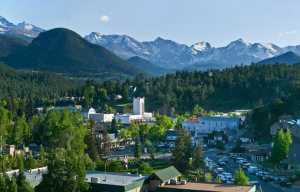 In the village, herds of elk and deer lunch on the golf courses and stroll down the streets. 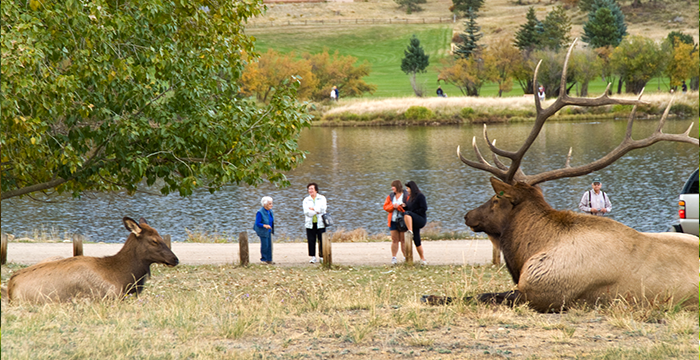 In Rocky Mountain National Park, animals sometimes linger near Moraine Park or Horseshoe Park. Bighorn sheep cozy up to mineral licks distributed around aptly named Sheep Lakes. Smaller animals, including curious marmots and squeaking pikas, scurry across the alpine tundra, while tuft-eared Abert&apos;s squirrels climb Ponderosa pines. Birders flock to this region lured by the more than 300 species that flit among the trees in a bird sanctuary by Lake Estes and in the National Park, which is a designated Global Important Bird Area. 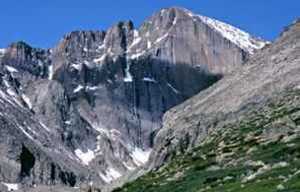 The more notable species in the area that also encompasses Roosevelt National Forest include red-tailed hawks, whitetailed ptarmigan, blue dusky grouse, three toed woodpeckers, mountain chickadees and Northern pygmy owls. To stack your odds of observing animals, head out at dawn or dusk. When watching them, take care to keep your distance. Binoculars or a telephoto camera lens enables you to view them closely without infringing on their space. Females with young might become aggressive. Even gentle appearing deer can be dangerous, especially during the mating season. If you see a crowd of cars stopped alongside the road, chances are good someone has spotted an animal. Stop and park off the roadway only if you can do so safely. Remain quiet so you won&apos;t scare the animals. Keep all pets inside the car. If the animals seem edgy, back away quietly. 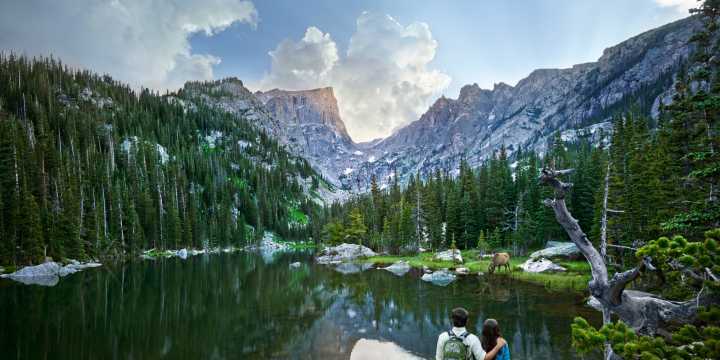 By keeping safety in mind, you ensure a positive experience for you-and for the animal that has just made your visit to Estes Park that much more memorable. After all, you just encountered a true native! Learn more about the best places to spot wildlife, additional safety tips and more on our Wildlife Watching page.